K.B. Andersen Fund of the Saint Paul Foundation. The impact of your new and increased donations of up to $15,000 will double thanks to this matching grant. Together we can inspire, enrich and renew our community through the experience of art in nature. Your gift supports artist led educational programming, concerts, and the continued growth of a true gem. Discover Art Unframed. Connect with Nature. Restore the Spirit. Donate. All gifts of any size are welcome. Your one time gift will help us continue to care for the park and provide quality art experiences for the community. Your ongoing monthly support will help us build upon our legacy and honor what makes Caponi Art Park unique: Art, Nature, Learning, Community and Passion. Please consider a $5, $10, or $20 monthly commitment in support of Founder Anthony Caponi’s legacy. It’s convenient– your contribution is charged automatically to your credit card. It’s significant– more of your donation goes to programs and less to administrative expenses. It’s lasting– spreading your support over time is easier on your budget and gives the Art Park a reliable stream of support. Many companies match their employee’s charitable contributions to non-profit organizations. You can increase your support of the Park by asking your employer about their matching gift program. Does my employer have a gift matching program? Check here! 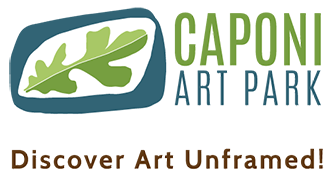 Caponi Art Park is a non-profit organization under IRS section 501(c)(3). All donations are tax-deductible to the fullest extent of the law. Gift envelopes and donation boxes are available at the information stands. Or drop a donation in our event donation bucket when attending one of our performances. Designate all or a portion of your charitable gift to Caponi Art Park when donating to United Way. Ask your employer for the designation form when making your donation. A donation of materials or services to the Park is greatly appreciated, from landscaping blocks to park benches to copying services. Call 651.454.9412 to inquire how you can give an in-kind gift.